In what he described as probably the “last time I speak to this group” as chairman of the House of Representatives Transportation and Infrastructure Committee, retiring Rep. Bill Shuster, R-Penn., (seen above) noted in remarks Sept. 24 at the annual meeting of the American Association of State Highway and Transportation Officials that he believes a vehicle mile travelled or VMT fee is what will most likely replace the motor fuels tax in a decade as a way to generate funding for transportation infrastructure. In the “short-term,” however, Shuster reiterated his proposal to increase the federal tax on gasoline by 15 cents per gallon and the federal tax on diesel fuel by 20 cents per gallon to help keep the Highway Trust Fund solvent until it can be transitioned to a more “sustainable revenue source” such as a VMT. 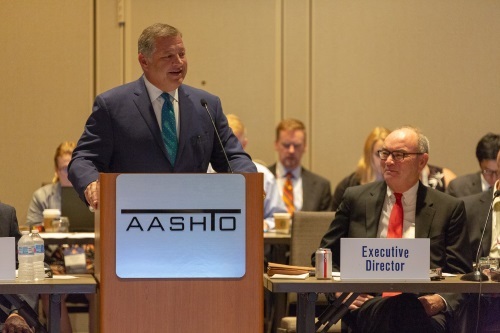 Shuster also noted in his remarks that he still believes the U.S. Army Corps of Engineers needs to be relocated from the Department of Defense to the USDOT.